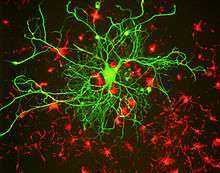 Neurofilaments (NF) are the 10 nanometer or intermediate filaments found in neurons. They are a major component of the neuronal cytoskeleton, and are believed to function primarily to provide structural support for the axon and to regulate axon diameter. Neurofilaments are composed of polypeptide chains or subunits which belong to the same protein family as the intermediate filaments of other tissues such as keratin subunits, which make 10 nm filaments expressed specifically in epithelia. The family of proteins making intermediate filaments is divided into 5 major classes, the keratins forming the classes I and II. Class III contains the proteins vimentin, desmin, peripherin and glial fibrillary acidic protein (GFAP). The major neurofilament subunits occupy the class IV family of intermediate filaments, along with two other filament proteins of neurons, alpha-internexin and nestin. The class IV intermediate filament genes all share two unique introns not found in other intermediate filament gene sequences, suggesting a common evolutionary origin from one primitive class IV gene. Finally, class V corresponds to intermediate filaments of the nuclear cytoskeleton, the nuclear lamins. The term neurofibril refers to a bundle of neurofilaments. These three proteins are often referred to as the "neurofilament triplet", and numerous specific antibodies to these proteins have been developed and made commercially available. Such antibodies are widely used to identify neurons and their processes in histological sections and in tissue culture. The SDS-PAGE molecular masses of the triplet proteins vary between mammalian species, with larger species usually having larger proteins. The real molecular masses of these proteins are considerably lower than estimated based on SDS-PAGE mobility, particularly in the case of NF-H and NF-M. This is due to the highly charged C-terminal regions of the molecules. All three triplet proteins contain long stretches of polypeptide sequence rich in glutamic acid residues, and NF-M and especially NF-H also contain multiple tandemly repeated serine phosphorylation sites. These sites almost all contain the peptide lysine-serine-proline (KSP), and phosphorylation is normally found on axonal and not dendritic neurofilaments. Human NF-M has 13 of these KSP sites, while human NF-H is expressed from two alleles one of which produces 44 and the other 45 KSP repeats. Neurofilaments are found in vertebrate neurons in especially high concentrations in axons, where they appear to provide mechanical strength and regulate axonal diameter. The fourth class IV subunit, alpha-internexin (NF66) was discovered much later than NF-L, NF-M and NF-H, and is found co-polymerized with these proteins in most mature neurons. It is generally expressed earlier in development than the other neurofilament proteins and may be found in some neurons in the apparent absence of the neurofilament triplet. The fifth protein belonging to class IV, Nestin, is found in developing neurons and glia, and the presence of this protein is widely used to define neurogenesis. This protein is lost as development proceeds. In the adult mammal neurofilament subunit proteins coassemble in vivo, forming a heteropolymer that contain NF-L or alpha-internexin plus NF-M or NF-H. Peripherin and vimentin may incorporate into neurofilaments along with these proteins. The NF-H and NF-M proteins have lengthy C-terminal tail domains that appear to control the spacing between neighboring filaments, generating aligned arrays with a fairly uniform interfilament spacing as seen in axons. Antibody stain against neurofilament (green) and Ki 67 (red) in a mouse embryo 12.5 days after fertilization. 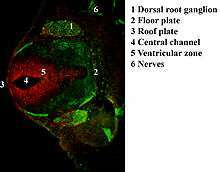 The cells expressing neurofilaments are in the dorsal root ganglia shown in green while proliferating cells are in the ventricular zone in the neural tube and colored red. During axonal growth, new neurofilament subunits are incorporated all along the axon in a dynamic process that involves the addition of subunits along the filament length, as well as the addition of subunits at the filament ends. Rat brain cells grown in tissue culture and stained, in green, with an antibody to neurofilament subunit NF-L, which reveals a large neuron. The culture was stained in red for alpha-internexin, which in this culture is found in neuronal stem cells surrounding the large neuron. Image courtesy of EnCor Biotechnology Inc.
After an axon has grown and connected with its target cell, the diameter of the axon may increase as much as fivefold. The level of neurofilament gene expression seems to directly control axonal diameter, which in turn controls how fast electrical signals travel down the axon. Mutant mice with neurofilament abnormalities have phenotypes resembling amyotrophic lateral sclerosis. Micrograph of white matter (bottom of image) and the anterior horn of the spinal cord showing motor neurons with central chromatolysis. Neurofilament immunostain. Neurofilament, NF, immunostaining is common in diagnostic neuropathology. It is useful for differentiating neurons (positive for NF) from glia (negative for NF). ↑ Löhrke, S; Brandstätter, JH; Boycott, BB; Peichl, L (Apr 1995). "Expression of neurofilament proteins by horizontal cells in the rabbit retina varies with retinal location.". Journal of neurocytology. 24 (4): 283–300. PMID 7543937. ↑ Alberts, Bruce (2002). Molecular biology of the cell (4th ed.). New York: Garland Science. ISBN 0-8153-3218-1. ↑ Lalonde R, Strazielle C; Strazielle (2003). "Neurobehavioral characteristics of mice with modified intermediate filament genes". Rev Neurosci. 14 (4): 369–85. doi:10.1515/REVNEURO.2003.14.4.369. PMID 14640321.